I asked Steve what he would want to be remembered for in one hundred years and it wasn’t what you may expect. The answer is like a time traveler from the future talking of the distant past in a very eclectic way. Steve said, “I want to be remembered for placing a tool in the hands of people and giving them the power to access all the information in the world and make a future how they want it. This is my legacy.” The first evolution of technology was by Johannes Gutenberg who produced the first printing press with moveable type, placing previously hand written books owned by a relatively few into the hands of many. It was the first era of mass communication and changed education thus changing humanity forever. Fast forward to 2007 and Apple releases the first iPhone followed by the iPad in 2011. Steve’s vision placed them into the hands of people who were now able to comfortably reach all information. Apple was the second era of mass communication and it also changed the world forever. It not only placed all the world’s information at a fingers reach but it gave people the ability to change their future and affect the world in any way they chose. Steve did not conceive the iPhone and iPad with a mandate of how to use them. He simply placed the tool into your world at the gentle stroke of a finger. It is a precious gift from a Hippie of love and enlightenment to the rest of the world. In one hundred or one thousand years, will we remember Steve Jobs for the iPhone and iPad? Possibly not. However he will be remembered for the concept of convenient and easy access to information and being the second epoch of communication placed in the hands of ordinary people. The personality cult around Steve Jobs would be lost in the past and his minor failings as a man forgotten as we access unlimited knowledge in a future world. It is humanities choice where they go to from here. So let us listen as Sussan allows Steve to speak through her from beyond as we ask questions that a generation would want to ask. Where did the source of the visionary come from? How did he actually conceive the idea for iPhone and iPad technology? There was also the bizarre estrangement from his girlfriend Chrisann Brennan and reconnection with daughter Lisa. 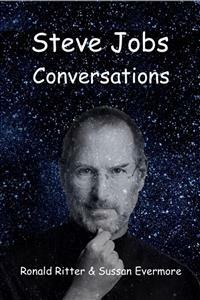 Also Steve’s commitment to Zen Buddhism and how it impacted on his life and the Apple Corporation. He was at times a tyrant, a pacifist and Zen Buddhist who believed passionately in meditation. So how do all these contradictions fit into the man who once ran one of the most powerful digital technology companies in the world? He also leaves us with a future prediction for technology. A device which stares at us in the face so simplistic in its presence that it may have been overlooked. But its simple design underlies complex technology that could become the biggest income earner in the history of Apple. Well simply, let’s ask Steve. The first evolution of technology was by Johannes Gutenberg who produced the first printing press with moveable type, placing previously hand written books owned by a relatively few into the hands of many. It was the first era of mass communication and changed education thus changing humanity forever. Fast forward to 2007 and Apple releases the first iPhone followed by the iPad in 2011. Steve’s vision placed them into the hands of people who were now able to comfortably reach all information. Apple was the second era of mass communication and it also changed the world forever. It not only placed all the world’s information at a fingers reach but it gave people the ability to change their future and affect the world in any way they chose. Steve did not conceive the iPhone and iPad with a mandate of how to use them. He simply placed the tool into your world at the gentle stroke of a finger. It is a precious gift from a Hippie of love and enlightenment to the rest of the world. In one hundred or one thousand years, will we remember Steve Jobs for the iPhone and iPad? Possibly not. However he will be remembered for the concept of convenient and easy access to information and being the second epoch of communication placed in the hands of ordinary people. The personality cult around Steve Jobs would be lost in the past and his minor failings as a man forgotten as we access unlimited knowledge in a future world. It is humanities choice where they go to from here. So let us listen as Sussan allows Steve to speak through her from beyond as we ask questions that a generation would want to ask. Where did the source of the visionary come from? How did he actually conceive the idea for iPhone and iPad technology? There was also the bizarre estrangement from his girlfriend Chrisann Brennan and reconnection with daughter Lisa. Also Steve’s commitment to Zen Buddhism and how it impacted on his life and the Apple Corporation. He was at times a tyrant, a pacifist and Zen Buddhist who believed passionately in meditation. So how do all these contradictions fit into the man who once ran one of the most powerful digital technology companies in the world? He also leaves us with a future prediction for technology. A device which stares at us in the face so simplistic in its presence that it may have been overlooked. But its simple design underlies complex technology that could become the biggest income earner in the history of Apple. Well simply, let’s ask Steve. There has been so much written about Steve, first girlfriend Chrisann and daughter Lisa with books and movies that seem to want to tell the story of a man denying a child’s right to a biological father. There was a very complicated and estranged relationship between Steve and Chrisann as their lives interact constantly with utter hatred and bitter arguments over him not paying enough alimony and his on and off relationship with daughter Lisa. Nothing is really new in the story of two people bitterly separated, fighting over money and a child. It’s a story as old as time, except this is about Steve Jobs. A Buddhist and the visionary CEO of the most successful tech corporation the world has ever seen. So what’s new? We can talk directly to Steve and he can tell us his story through Sussan. Ron asks Steve: Welcome Steve, can we talk about your relationship with Chrisann? I would like to set the record straight from your viewpoint. Steve answers: Imagine if Chrisann had not got pregnant. I would have walked away from our dysfunctional relationship and she would have gone off into the sunset, end of story. Just normal stuff and we probably would not have spoken again. However, that wasn’t the story, I am not normal and anyhow the news of the baby didn’t fit in with my sense of destiny. I needed my freedom and Chrisann wasn’t in the plan and really, she was never going to be the one.